Line a 13×9 inch pan with foil and spray with cooking spray. In a very large saucepan, combine sugar and corn syrup. Heat just until bubbly. Remove from heat and stir in peanut butter and vanilla. Stir until well blended; Stir in cereal. Place chocolate and butterscotch chips in a microwave-safe bowl and heat on high until melted, stirring every 30 seconds. Spread melted morsels over top of cookies. Refrigerate until chocolate is slightly firm, then lift foil from pan and place on a cutting board. Cut into 3-4 dozen bars. Note: Alternatively, you may mix the sugar, corn syrup and peanut butter in a microwave-safe bowl, microwave it all on high for 2 minutes – stopping every 30 seconds to stir. Then stir in the vanilla and the Special K.
Thanks for posting recipe, easier than me digging thru piles for it!! Anonymous, I’ve also heard of people making them as drop cookie type things. It’s such a great and easy recipe. 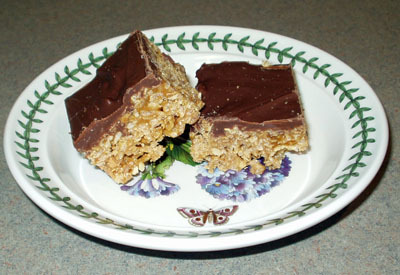 My family always makes these and we just call them Special K Bars. We make them in a jelly roll pan so they are a little thinner. Everyone always loves them! Did you figure out a way to make them on the healthy side. Is there a substitute for the syrup and sugar? Jeff, glad you liked the picture. My camera is getting old, so my pictures never turn out as good as most others I see. Joe, that is wild that she used Special K too. I wonder if she just thought it up like Tracy did or if she saw some sort of recipe suggestion saying to sub Special K. Meanwhile, I’m trying to figure out how I could turn these into a healthy breakfast bar — I’d have to lose the corn syrup, some of the sugar, and lighten up on the chocolate.Anonymouse, I haven’t had a Whatchamcallit in years, but eating one of these bars brought back up some sort of taste memory. Jen, I forgot to ask Todd those questions before the ceremony. Luckily, his wit and charm make up for his aversion to peanut butter and cereal. Oh, he doesn’t like bananas either. My mom used to make something like this, I think it even used Special K! She always made them for bake sale type events. They were always so good! Oh my, they sound good (and look good) . . . a soft whachamacallit! Yum! Thanks for sharing.